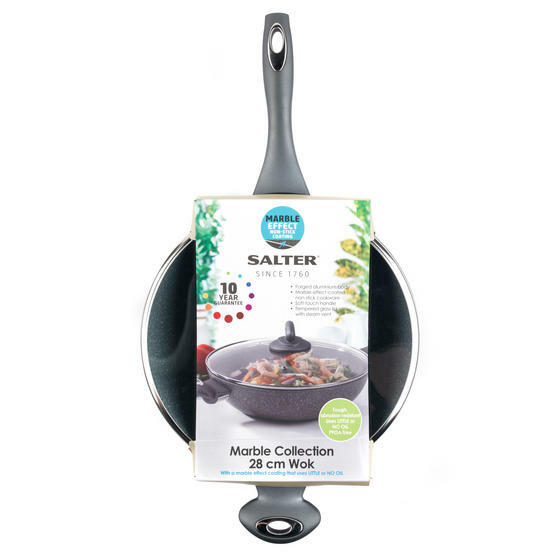 Use your Salter wok and tempered glass lid to cook a delicious, fast stir fry using less oil for healthier eating with little effort. The grey coloured wok looks clean and smart in your kitchen, with Bakelite silicone coated handles and lid knob for safer cooking. Measuring 28 cm, this easy to use wok suits all cooks, abilities and kitchens to enhance your cooking so you can impress your friends. Ideal for everyday use, the wok is even suitable for use in the dishwasher, so the cleaning can be as simple as the cooking.